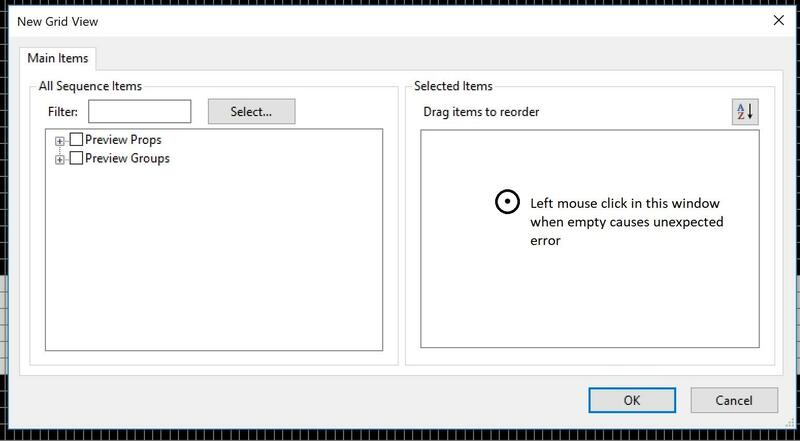 When using the 'append items to view' dialogue, left mouse click in the 'selected items' window when empty causes an unexpected error. See attachments. This happens when creating a new view, or when appending items to an existing view. 3. Unexpected error dialogue appears, requires saving and closing of all open sequences. This is not related to a particular sequence. Happens with existing sequences and newly created sequences. Thanks for reporting this issue! It will be fixed in the next release.